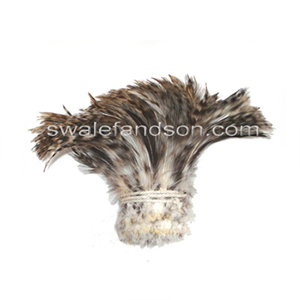 Our Rooster Tail Feathers are available in both natural and dyed colors. 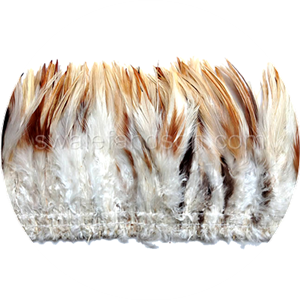 Though sometimes available in white and other mixed shades, our Natural Rooster Tail Feathers are primarily available only in Bronze and Half Bronze. Bronze a.k.a. 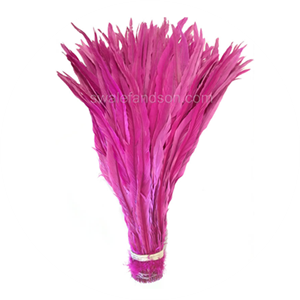 Natural Black Rooster Tail Feathers are a charcoal type black with shiny iridescence throughout the length of the feather. This iridescence is much like the iridescence of peacock feather but because it’s over a natural black background, they are not as vibrant as peacock feathers. 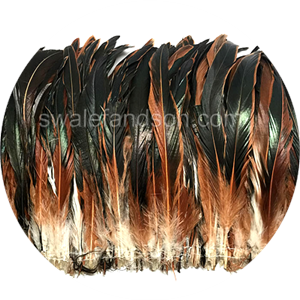 Half Bronze Rooster Tail Feathers are very much like the Natural Black except there is a streak of natural reddish brown running through the feather. When dyed it creates a very unique look. 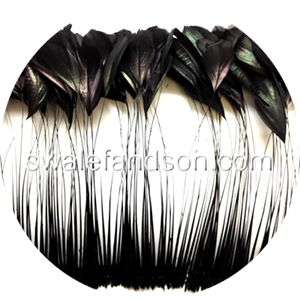 Most of our Dyed Rooster Tail Feathers are dyed over bleached natural black. When you bleach the natural black pigmentation out of the feather you are left with something roughly the color of sand. On it’s own it is a very nice light earth tone, but it also provides a canvas that can be dyed into rich bold colors. 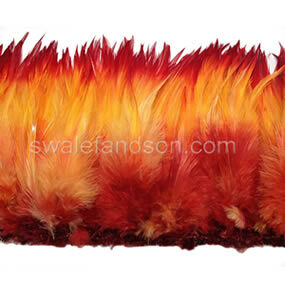 We generally offer Strung Dyed Rooster Tail Feathers in 8-10”, 14-16”, and 16-18” sizes. 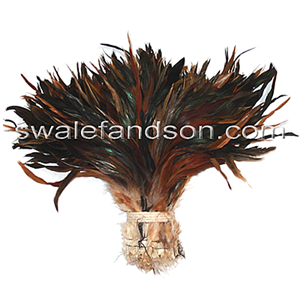 Though used in floral arrangements, masks, and other decorations, Rooster Tail Feathers are most commonly used by Danzantes Aztecas for use in their headpieces, also called copillis.